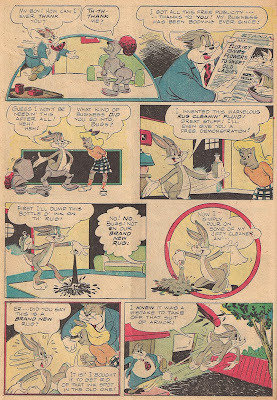 Looney Tunes and Merrie Melodies Comics: "Looney Tunes and Merrie Melodies"(Dell) # 73, November 1947: "Bugs and the Rug"
"Looney Tunes and Merrie Melodies"(Dell) # 73, November 1947: "Bugs and the Rug"
Regarding the previous post of the 1981 Bugs Bunny story, to quote comedian Larry the Cable Guy: "Lord, I apologize fer that right thar." 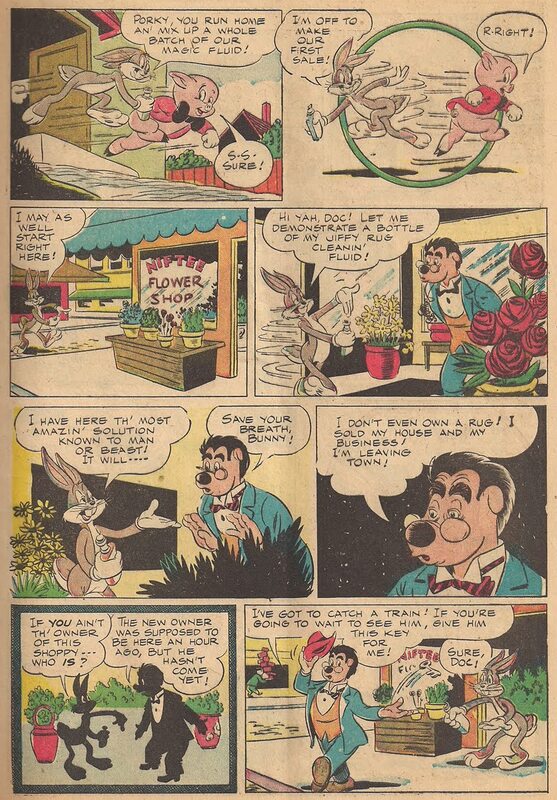 But compare that 1981 story with this gem from 1947. 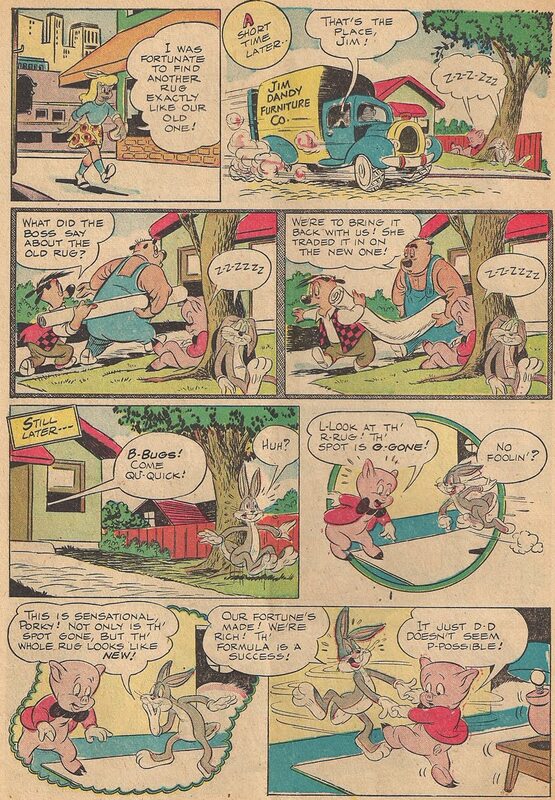 This one has GOOD art, good characterization, excellent staging, and clever writing. 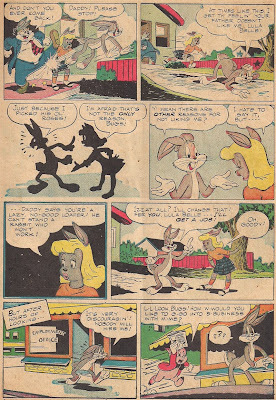 Bugs tries to impress his girlfriend, Lula Belle, but ends up making her father hopping mad. 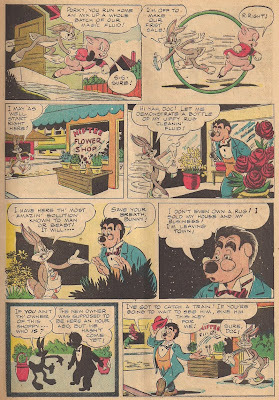 Bugs picks his roses and stains his rug with ink. 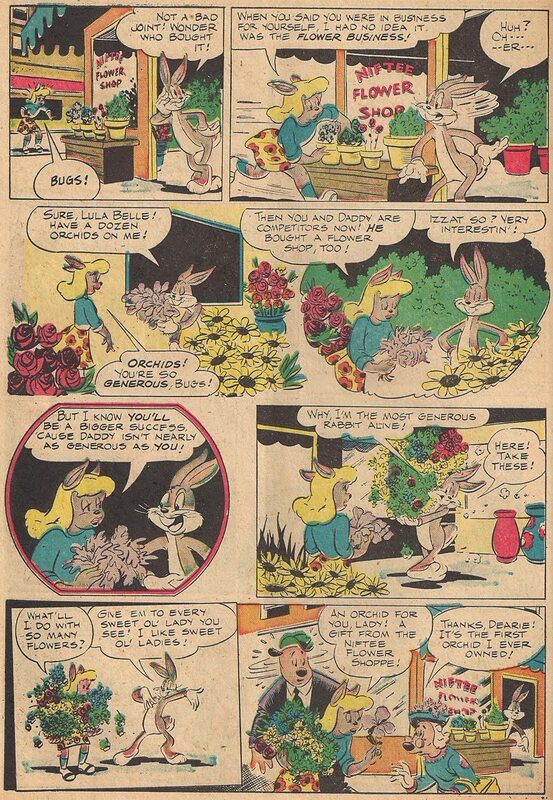 Lula Belle suggests that Bugs find a job so her dad will respect him. 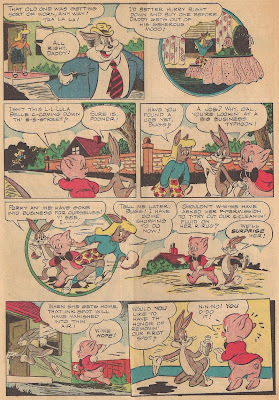 Bugs takes Porky Pig's suggestion of starting his own business, and decides to start with inventing a stain removing formula, and tests it on the ink-stained rug. Then the inevitable twist comes into play. 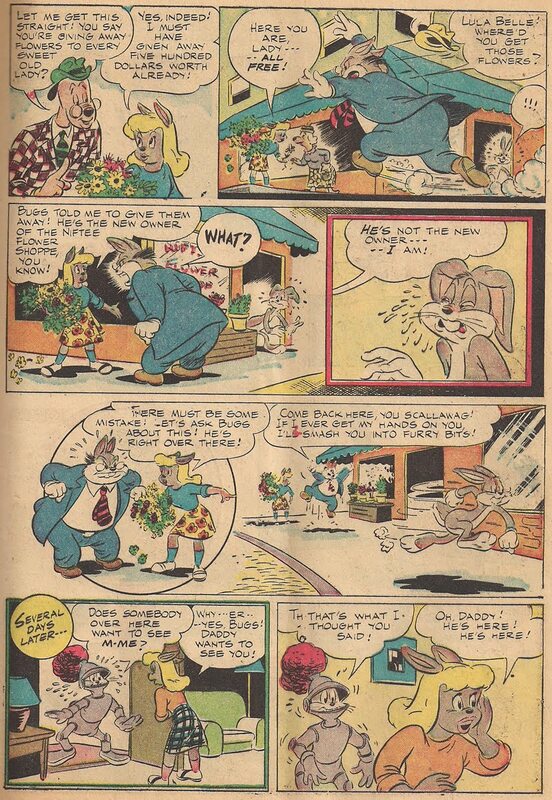 It's fun to see Bugs Bunny interpreted as a well-meaning loser, and his chemistry with Lula Belle, Lula Belle's dad, and Porky are interesting. 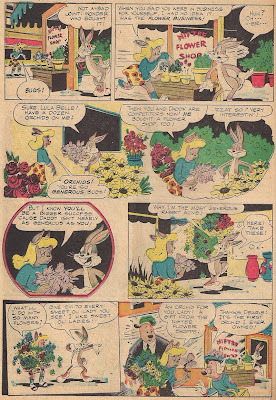 As for Lula Belle, she appeared several times in the mid to late 1940's comics, but never in the cartoons. 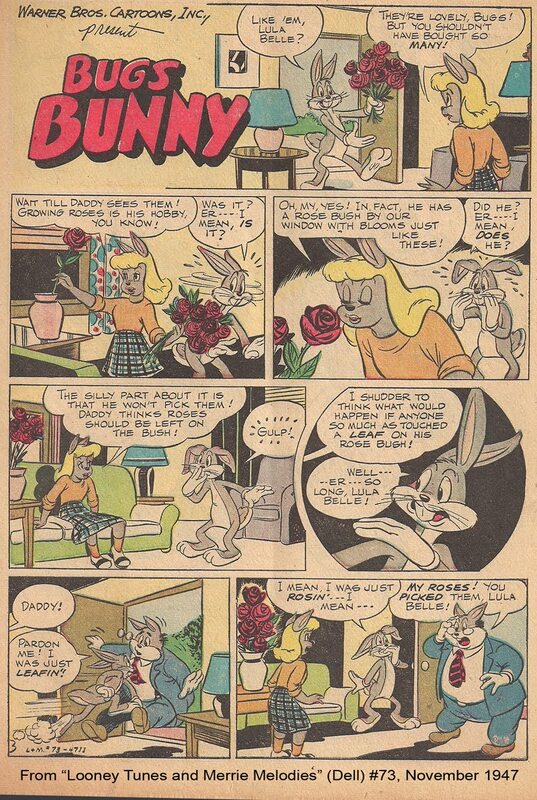 She was eventually replaced by Honey Bunny, who also never appeared in animated form. I'll get to Honey Bunny at a later date. 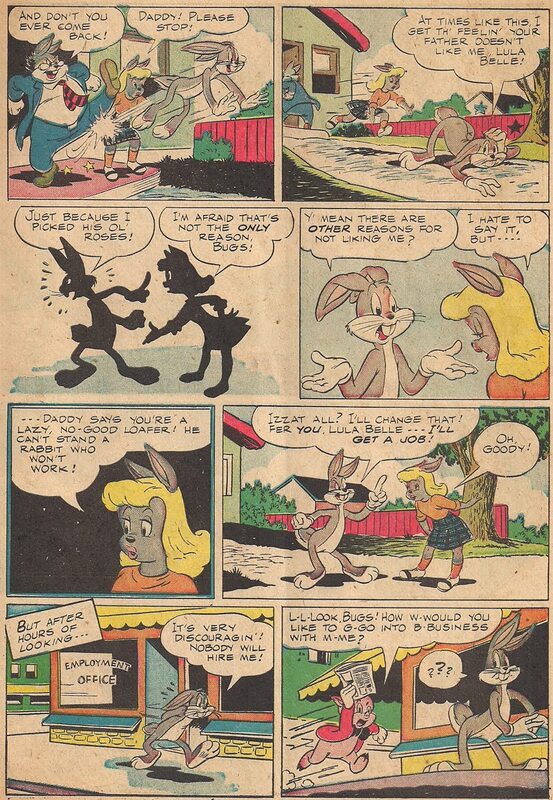 The only love interests for Bugs to appear in animated form were Daisy Lou in "Hare Splitter" (1948) and Lola in "Space Jam" (1996) and other modern Looney Tunes incarnations. Other interests were either robotic or undesirable. The writer of this story is unknown. 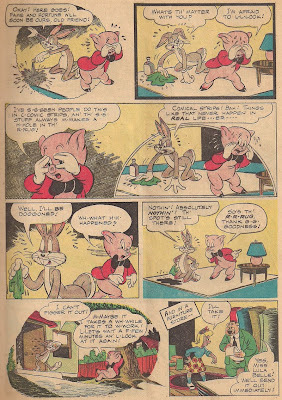 The artist was most likely Tom or Charles McKimson. *Update: Possible artist identified: Roger Armstrong. 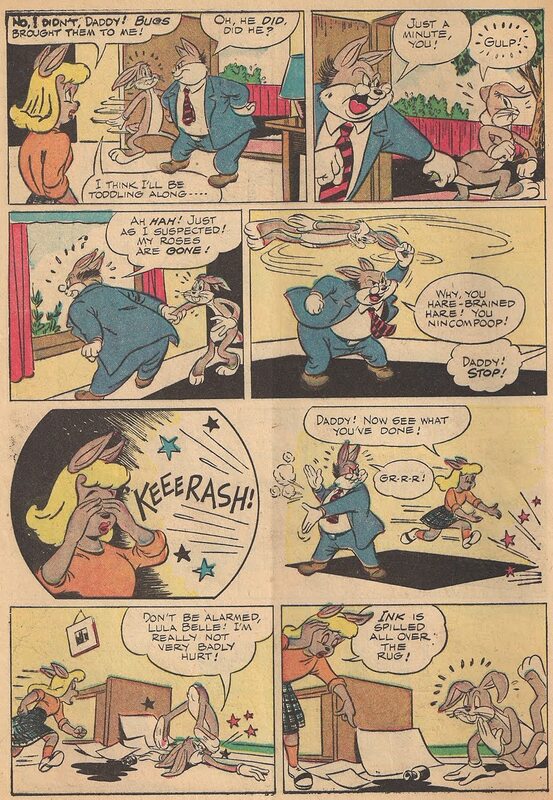 Don't forget Bugs' wife in "Hold the Lion, Please" who "wears the pants in the family." 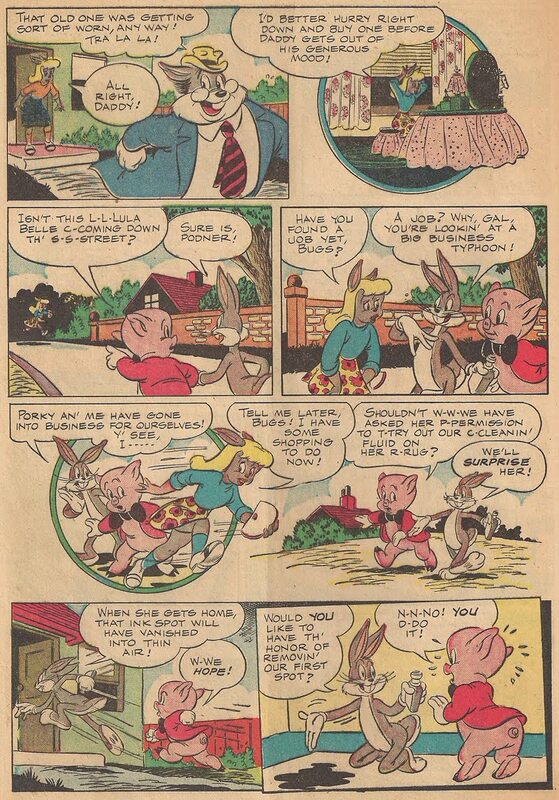 Conversely, I’ve linked to your Lula Belle post in the body of mine. Thanks for pointing this one out to me. 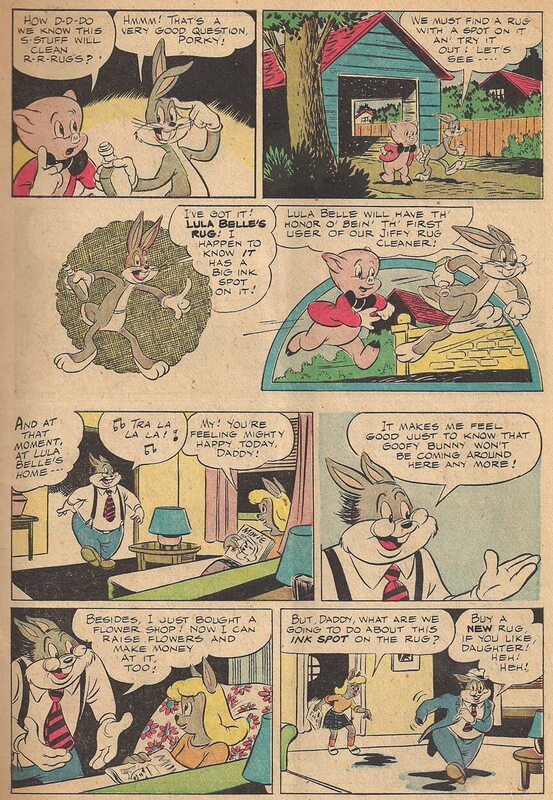 Thad, this is really drawn by Roger Armstrong—the designs of Porky and (black-nosed) Bugs cinch it. Don Gunn draws the Porky story in the same issue (and Ralph Heimdahl draws Mary Jane and Sniffles). 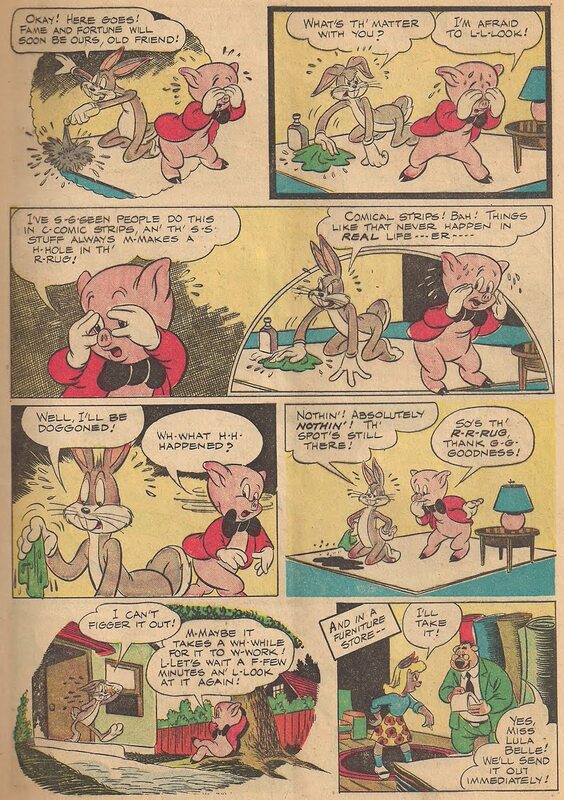 One issue earlier, in LTMM 72, the Bugs story is drawn by Gunn and the Porky by Armstrong, which was more typical of the time. Bugs is often a loser in this period. 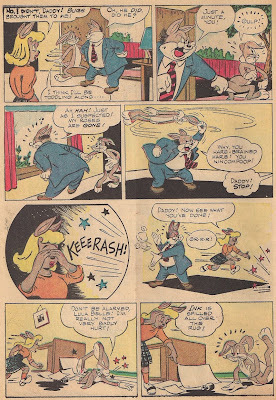 I think it resulted from a combination of factors: Western's moral determination that tricksters be punished (it's all over their West Coast "kids" books, even this early), and the fact that McKimson, from Clampett's unit, took a leading role fairly early on. 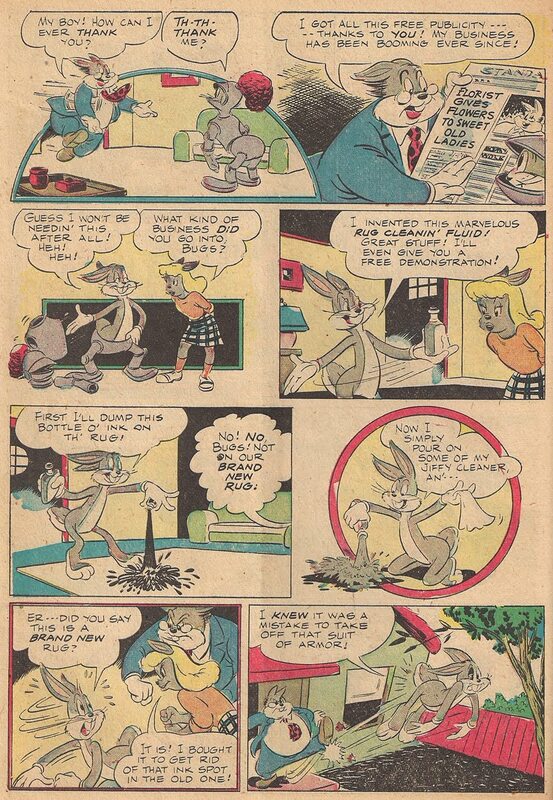 Some people today claim Bugs is faking his terror in FALLING HARE—I contend Clampett's unit simply considered Bugs as fallible as Daffy, and that's pretty much how he's portrayed in the 1940s comics. Ugh... 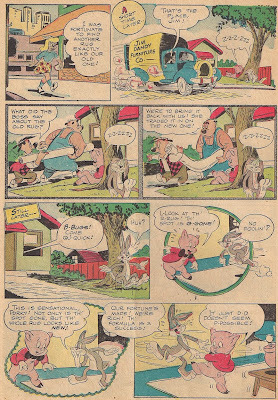 I mean TOM McKimson, from Clampett's unit. I’ve never really had a handle on Don Gunn, so my guess would be Roger Armstrong as well. It looks like him to me. @Joe: I actually have that Christmas story too. There were lots of funny, weird and great Christmas stories in the LT comics, including several giant "Bugs Bunny Christmas Funnies" annuals that had dozens of them. Expect to see several here when Christmastime rolls around! Can't wait to see some of those! 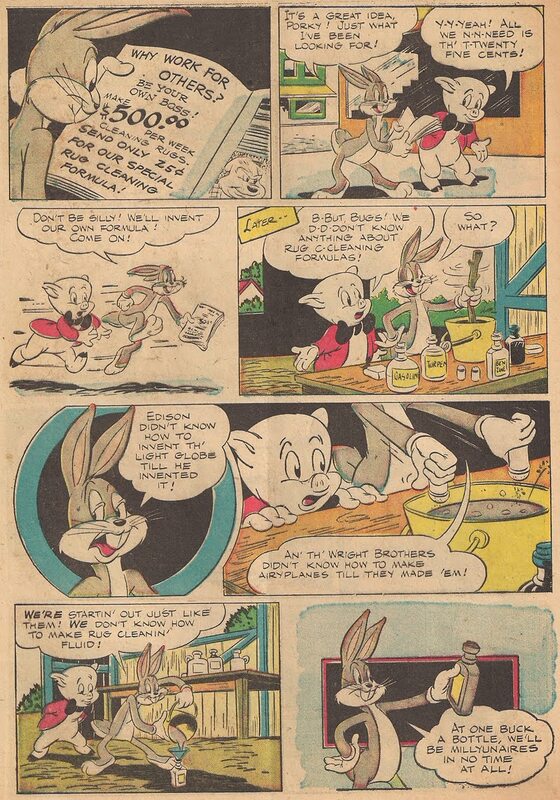 "Bugs Bunny's Album" (Dell) 1953: "Honey Bunny"
"Bugs Bunny" (Whitman)#233, 1981: "Food Feud"